It’s here! That amazing time of year! 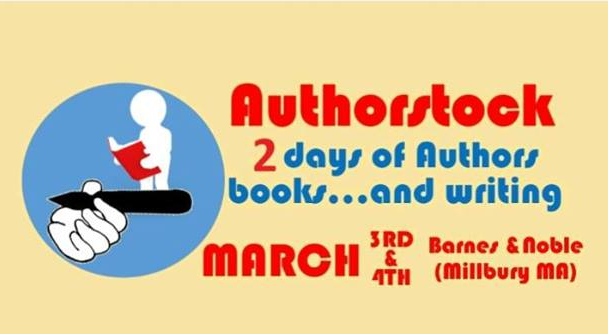 It’s AuthorStock 2018, happening Saturday, March 3rd and Sunday, March 4th, 2018. 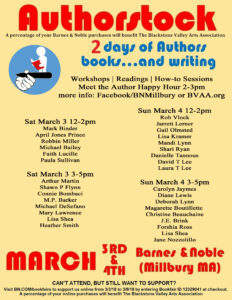 There are workshops, readings, seminars, how-tos, and much more! A share of proceeds benefits the Blackstone Valley Art Association! 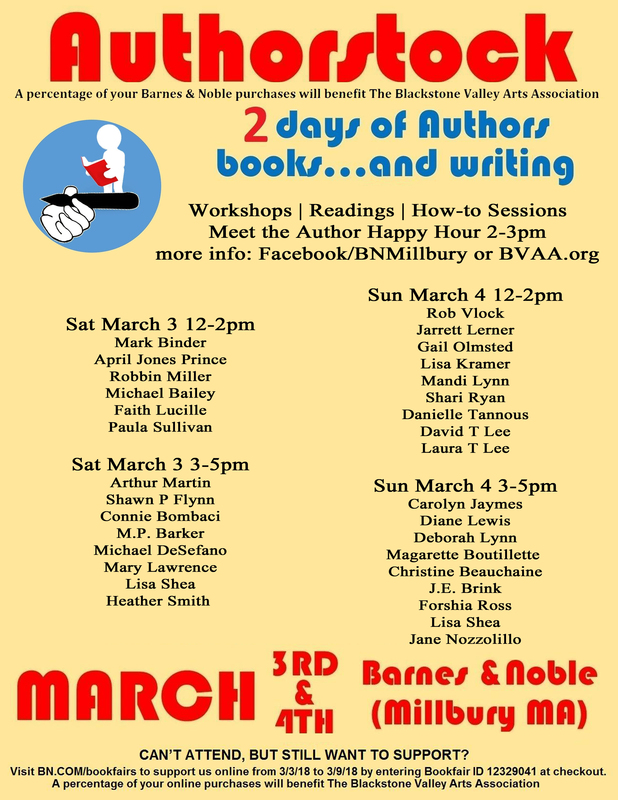 Over 30 authors from various genres confirmed! Join April for a special reading of Goldenlocks and the Three Pirates, where kids are invited to “join the crew” by choosing a pirate name and drawing themselves into the story! Join Robbin for a reading of Playgroup Time!, where EJ meets a new friend, Lewis, in a weekly playgroup who is crying and clinging to his mother. EJ runs over with a big smile on his face to show Lewis how much fun playgroup can be through adventure and a few itty bitty mishaps to make new friends. Join Mark as he talks about how he makes the connection between different age groups when writing. Michael presents an overview of the cover art creation process, one of those aspects of self-publishing that might not have to do directly with writing but is still an essential part of producing a book. Do you want a break from the monotony of your boring and pathetic life? Do you have a difficult time stifling laughs at funerals and other inappropriate places? Generally, do you like to find the funny side of things? If so, this is the book for you. Join Shawn as he talks about cats, cat quotes from famous people throughout history (i.e., Sigmund Freud said, “Time spent with cats is never wasted”), how people and other influences impact our life, and their effects. Join Connie as she discusses the reasons she wrote Hogan’s Hope, a short reading, and a demonstration with Judea, her deaf service dog on how deaf dogs can learn. Michael will describe the synopsis of the book, read a portion regarding the musical tie-in, and play some of the music composed along with the book. Get a free CD of the music with every signed book purchased! A reading of A Song in the Rain, the first novel written by Heather Smith, a young engineer and alumna of Virginia Tech. Followed by Q & A.
Mary will introduce her series of books and then read from Death at St. Vedast. Join David and Laura, who published their first books at age 7 and 10, as they discuss their journey as child authors with readings of featured selections. Join Jarret as he discusses aspects of his book in detail, WHY he choose to write about what he did, relate it to writing, discussing his writing process and pull-back-the-curtain on the whole book-writing/book-making process. Mandi Lynn shows how to use YouTube & social media to promote books and find new readers. Join Gail for a reading from her book Jeep Tour followed by Q & A. Join Shari for a background of her book, Last Words with a reading. Christine will read from her book Winds Of Providence: A Novel of the Hurricane of ’38 and a preview of her soon to be published book. James present aspects of his book along with discussion on Artificial Intelligence, and Q & A. Join Diane as she conducts mediumship (connecting with someone crossed over) for one individual in the group. Join Magarette for a musical performance with tie in to her book. Join Forshia for a workshop on overcoming depression with a free workbook for attendees. by entering Bookfair ID 12329041 at checkout. Here is a 8.5 x 11 sized JPG for you to download and print!